The necklace has bright colors, clear graphics, and supports a cause that is important to me. Thank you for allowing me to show my support for Standing Rock and clean water in such a beautiful way. I really like the design. 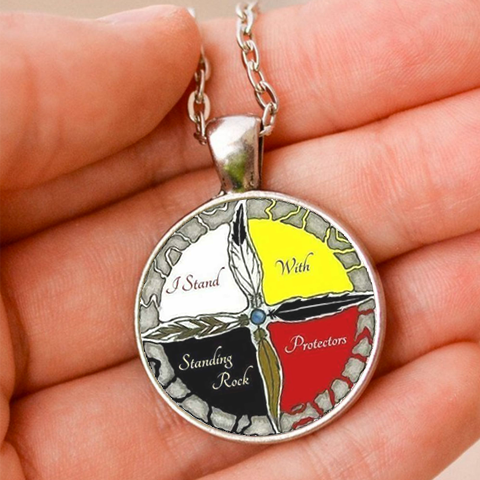 I haven't worn jewelry in years but this design and the meaning behind it moved me. It feels good. I feel good wearing it and I sincerely hope that the proceeds help the water protectors and everyone involved in standing with Standing Rock. I love this necklace - the quality is everything that I expected and more! Light weight and very comfortable, it's fun to wear it every day.